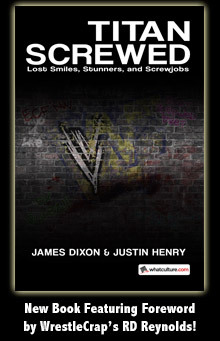 Headlies: The Slaters Celebrate Thanksgiving - WrestleCrap - The Very Worst of Pro Wrestling! Pineville, WV – As the sun began to set over Noble’s Trailer Park, the Slater Clan gather ’round their supper table to enjoy their Thanksgiving meal. Current WWE Smackdown Tag Team champion Heath Slater proudly sat at the head of the wobbly card table, looking over his kin. Slater’s many children, gathered around their 1977 Panasonic Quintrix television set, waved in approval. “Come on, kids. Get your vittles before Uncle Rhyno eats them all!” shouted Slater’s wife, Beulah. 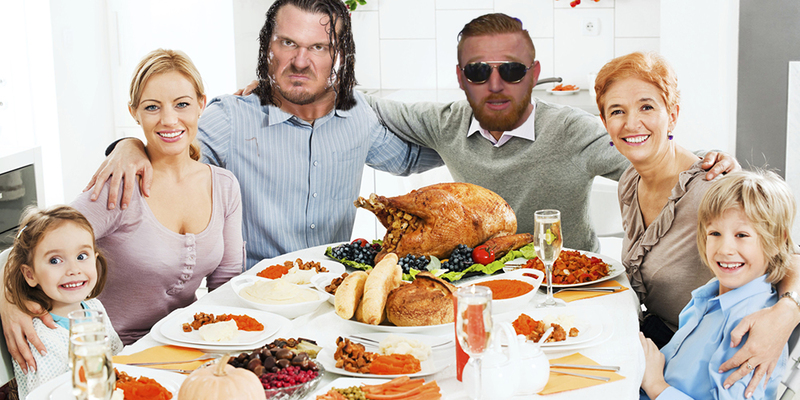 Slater’s partner Rhyno also sat at the table, silently eating a pile of Lunchables that Beulah had set out as appetizers. Beulah placed an impressive spread of cocktail wieners, Steak-Umms, Hot Pockets, Hungry Jack potatoes, and cans of Dr. Thunder soda. The family sat in their mismatched chairs and bowed their heads. “Smackdown Live rules!” said the family in unison. Slater then started carving the turkey which looked suspiciously like the Gobbledy Gooker. 4 Responses to "Headlies: The Slaters Celebrate Thanksgiving"
I guess they can’t wait to gobble up the leftovers. With Gooker on the menu it really is a Gory Guerrero Special. You know, Dr. Thunder was much better when it was “Southern Lightning”. Funnier still, if it had been a POOL TABLE. I just recently rediscovered my childhood affection for Steak-Umms. Damn, but those things are good. Looooove me a Steak-Umms and cheese sammich. With mayo!